The anticipation. The excitement. The eagerness. The desire to please. Consuming thoughts. Irrepressible smile. Immense feelings. Overwhelming emotion. Do you remember? If so, you probably realize you don’t still feel the same way you did when that love was fresh and new. Hopefully, though, the love you experience now is deeper and better, less based on emotion and more on relationship. While this description certainly describes the time I first fell in love 27 years ago with the man who is now my husband, that’s not the love relationship I’m talking about here. Do you remember the first time you truly realized how much God loves you? Remember when you discovered he wasn’t a distant God but a personal Savior? What Do you remember when you first realized that he loved you enough to come to this earth as God in flesh? And what about the knowledge that your sins are wiped away as if they never happened? With that first love came a fervor, an unbridled enthusiasm. Along with it came an understanding of the seriousness of sin and the thrill of being forgiven. When I think of what it means (and feels like) to fall in and out of love, I better understand the point God wanted to make to the Ephesians and why this message is so timeless and so very relevant for us still today both as individuals and as the corporate church. 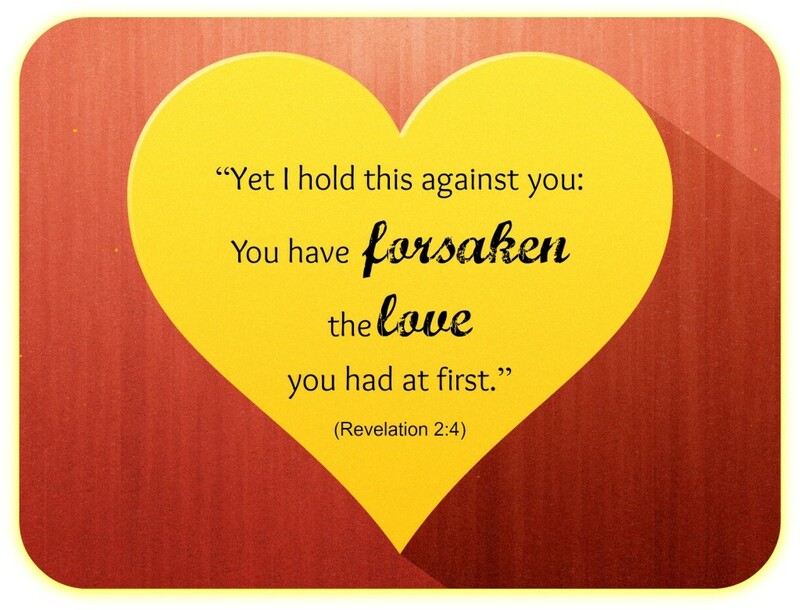 Forsaking your first love means you neglect it. You find yourself going through the motions of life, doing the busyness of life much like the Ephesians did. Revelation 2:2-3 tells us they worked hard, persevered, resisted sin, sought truth & endured hardships all without becoming weary. Yet, they were still found guilty of leaving the love they had when they became Christians & formed the church. In other words, they lost the fervor (earnest feeling, ardor, passion and zeal) they once had for God. They became apathetic and were simply “doing church” without truly loving God or other Christians. Been there? I have. When my husband and I grow distant from each other, even if just a little, we find that returning to what initially helped our love grow — spending quality time together, listening intently to each other, intentionally doing acts of kindness for one another, preferring one another, etc. — helps us return to and even go deeper in our love for one another. Remembering these varying degrees of love I’ve felt over the years for my spouse helps me better understand how to return to the fervor I once had for Christ before apathy and boredom crept into my life. The word used for “first” in this context means foremost, as in time, place and order, and the word used for “deeds” means toil or effort. In other words, get your priorities back in order and do the most important things again, things that seemed so natural at first. For the Christian, this means putting your relationship with God first, making it your top priority. This begins when we realize what we’ve stopped doing that we need to go back to doing. It also means ridding our lives of that which draws us away from him. It involves asking for forgiveness for the neglect and the wandering. It means returning to a dependence on him to continually rekindle that first love within our hearts and lives. It also means making a habit of doing the things that continually deepen our connection with him. DISCUSSION: What practices can you return to to rekindle your connection with God? 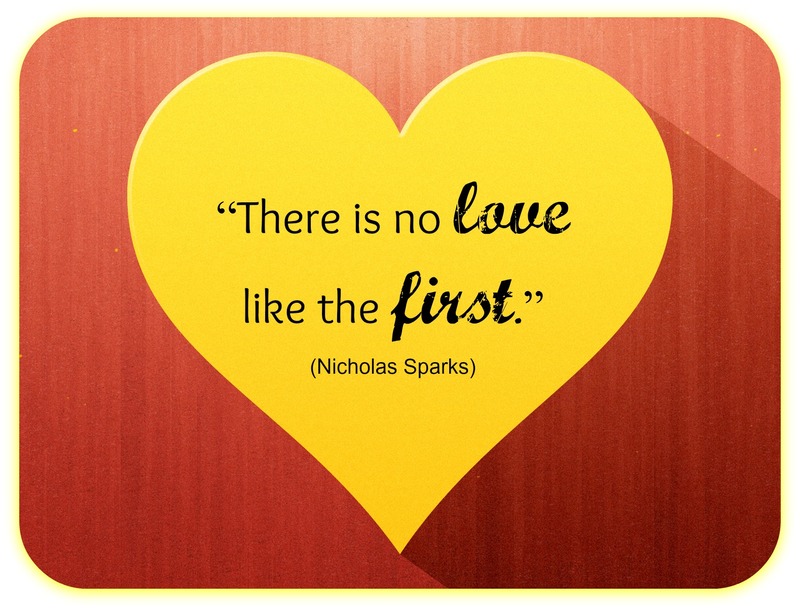 What priorities need reestablished in order for love to be the primary driving force in your life? This entry was posted in Focus, Relationships and tagged bible, bored, boredom, busy, busyness, Christ, christian, connect, connection, forgive, forgiven, going through the motions, habit, idle, important, individual, intentional, knowledge, listen, listening, love, move, passion, path, practice, priorities, priority, Ruth, smile, struggle, talking, time, truth, victory, words, work by admin. Bookmark the permalink. I've read "When I Don't Desire God" by John Piper and have gone back through it occasionally when I felt that my fervor for God was waning. That's a great resource you can check out that talks a lot about this. For me, it comes a lot with prayer – praying that God would ignite in me a passion for him. And then making it a habit of trying to regularly be in the word and to worship. It sounds kinda obvious, really! But I've found it effective. Thank you for the resource idea, Loren. Piper usually has good input. You hit on the keys for sure: Prayer and a habit of the Word and of worship. Sometimes the obvious isn't so obvious though, have you ever noticed that? You mentioned reviewing Piper when you felt your fervor waning… do you ever feel something is amiss and not notice this is the problem right away? Then, when you do, you're like "Duh!" That happens to me every so often. That's why the habits you mentioned are so important regardless of how we feel. I'm sort of in this mode right now Kari. My recent posts (the past two) show what is happening in me and I honestly believe it is because of this very idea. Oh do I get that, my friend. In light of your comment here, I see more of where you're coming from in your last two posts. Can I help? I'd appreciate a prayer for clarity and direction. I don't believe God wastes anything, especially when He calls us to Himself. I want to find out what He is calling me to/for. Thanks. You got it! No, He doesn't waste anything. Nothing is a coincidence either. The desires stirring in your heart are there for a reason. I've been studying Nehemiah lately and was especially struck by how he spent 4 months in prayer and fasting before he took action on the stirrings within him. You know how to reach me if you want objectivity from a bit of a distance. Praying first, prayer second, prayer third. A good book on HIs love for me will usually give me the encouragement I need. My go to verse is always II Corinthians 5:14-15, it has the power to draw be back into HIs love for me which has the power to motivate love for Him. Good post Kari. Great advice, Betty! Especially love the emphasis on the power of God\’s love. It's hard for me to pin down when I'm in those moments, but I've been seeing a correlation recently. When my walk and relationship simply falls under obligation and I lack joy, it's all hard and burdensome. When I get to pray, worship, read scripture, write, and reflect just because I desire to be with Him, there's such a difference. So how do I get there? Faith comes by hearing and hearing by the word of Christ. What wakes me up is a word or impression from Him, and He's so faithful to provide it over and over. Thanks Kari. Well said, Jason. A steady diet of God\’s word keeps the line of communications open. It keeps that first love alive and thriving. Any relationship requires regular and intentional dedication to maintain it. Whether it's a loved one, friend, or God we must spend time with them and doing the things that grow the relationship. It allows our love for God to thrive. Great post!!! \”Regular intentional dedication\”… You got it Dan! One thing I like to do is go back and read my journal entries. This helps me see where I've come from, how much I've grown and how faithful God has been in my times of trial. One thing God has been teaching me is that love is more than a feeling. I may not always "feel" God, but I can have certainly that He is here, that He loves me. I'm learning to trust Him and His Word despite my feelings. That's a wonderful blessing as my feelings often deceive me. But this is also a hard lesson to learn. Have a lovely Valentines, Kari. God bless. Thanks, TC. I have to tell myself \”facts over feelings\” (God\’s word over my human emotions) often. That gets me focused again on who he is. I have not read much of my own journals… Need to, but haven\’t been able to get myself to yet.